HOW ORTHOFEET MEN'S HEEL PAIN SHOES WORK TO HELP ALLEVIATE HEEL PAIN? 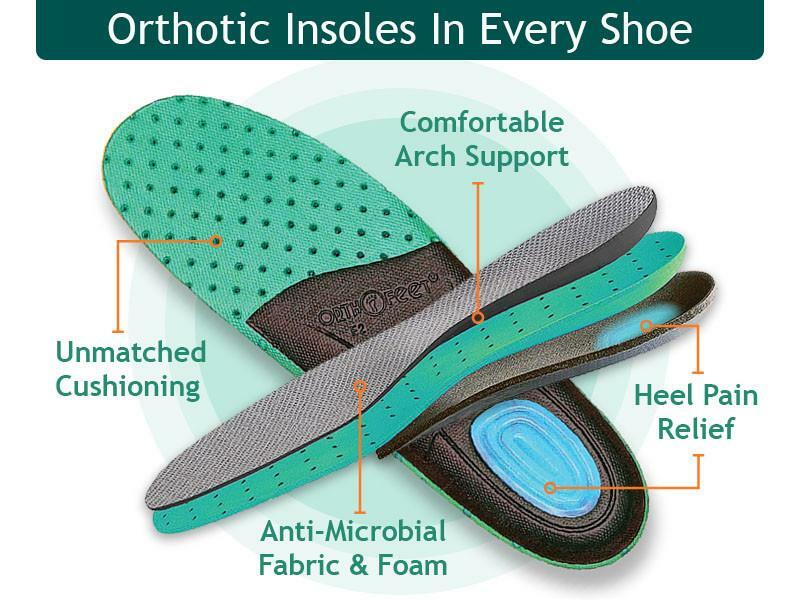 Orthofeet supportive shoes feature advanced orthotic insoles that reduce strain on the plantar fascia and help alleviate men's heel pain and heel spur symptoms. The Ortho-Cushion TM system reduces impacts on the heel and foot, softening every step you take. Upgrade to the most comfortable and supportive men's shoes: Walk Comfortable & Pain Free or Your Money Back!
" Struggled with heel pain for years. No more pain thanks to these shoes. Felt wonderful from the moment I put them on." 4. Works wonders to alleviate men's heel pain & plantar fasciitis. ● Help facilitate foot motion. "I struggle with heel pain for years. No more thanks to these shoes. Felt wonderful from the moment i put them on." "I suffer from Plantar Fasciitis and these shoes have given blessed relief from foot pain. The supporting arches and cushioned heel make walking a pleasure again." Heel pain is typically felt on the underside, or back of the heel, and can range from mild to extremely painful. It also has a range of causes, the most common being plantar fasciitis, a main cause of heel spurs. A heel spur is a calcium deposit that causes a bony like protrusion on the underside of the heel bone. Heel spurs usually start at the front of the heel, but they can extend all the way to the arch of the foot. Although heel spurs are often painless, they can cause a lot of heel pain. The pain can be intermittent or chronic, and inflammation sometimes occurs at the point of the spur’s formation. What causes it? While sprains, strains and fractures can cause heel pain, most heel pain is caused by repetitive stress or pounding on the heel rather than by a single injury. Certain foot conditions such as heel spurs and Achilles tendonitis can also cause heel pain, as can certain medical conditions such as arthritis and diabetes. In addition, abnormal walking gaits, flat feet, obesity, and ill-fitting shoes can also cause heel pain. How are heel spurs prevented and treated? Heel pain caused by heel spurs, unlike other foot conditions, may not respond well to rest since the pain is often at its worst when first getting up in the mornings. The best treatment for heel spurs is stretching exercises, shin splints, pain-relief medication, corticosteroid injections, and physical therapy. 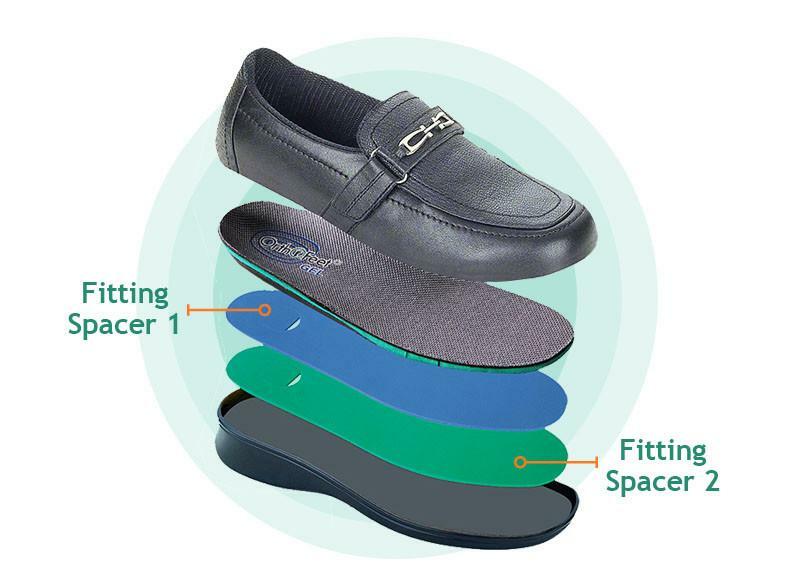 Special men’s orthopedic shoes for heel spurs or men’s orthopedic shoes for heel pain and heel pain insoles that help correct biomechanical imbalances, have also proven very effective in helping to treat heel spurs and heel pain. Since the purpose of shoes for bone spurs is to reduce strain on the plantar fascia and alleviate heel pain and heel spur symptoms, shop for men’s heel pain shoes that provide good cushioning, which helps reduce impacts on the heel.